7 Basic Brain Facts [click here for more facts]: (1) The typical brain is ~2% of your total weight but it uses 20% of your total energy and oxygen intake. (2) >100,000 chemicals reactions/sec occur in your brain. (3) The latest estimate is that our brains contain ~86 billion brain cells. (4) In contrast to the popular belief that we use ~10% of our brains; brain scans show we use most of our brain most of the time. (5) There are as many as 10,000 specific types of neurons in the brain. (6) Cholesterol is an integral part of every brain cell. Twenty-five percent of the body’s cholesterol resides within the brain. (7) Your brain generates between 12-25 watts of electricity, which is enough to power a low wattage LED light. 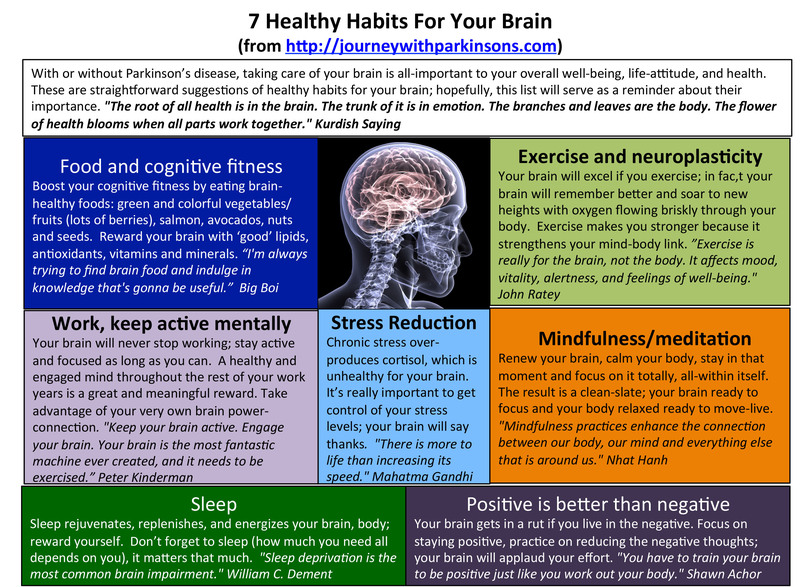 7 Healthy Habits for Your Brain: With or without Parkinson’s disease, taking care of your brain is all-important to your overall well-being, life-attitude, and health. These are straightforward suggestions of healthy habits for your brain; hopefully, this list will serve as a reminder about their importance. Here is a 1-page summary of the “7 Healthy Habits for Your Brain” (Click here to download file). Exercise and neuroplasticity: Exercise is almost like a soothing salve for your brain. Some benefits of exercise include helping your memory and increased flow of oxygen to brain, which energizes the brain. Exercise is good for both your heart and your brain. Exercise can reduce inflammation in the brain and increase hormones circulating to your brain. For a brief overview on the benefits of exercise to your brain, click here. Neuroplasticity is the ability to re-draw, re-wire the connections in your brain. What this means is that neuroplasticity is a concerted attempt of neurons to compensate for brain injury/disease. Neuroplasticity ultimately modifies your brain’s activities in response to changes in these neuronal-environments. There is much positive evidence in animal models of Parkinson’s regarding exercise-induced neuroplasticity. The same benefits are now being tested in humans with Parkinson’s and the results are most encouraging. One of the numerous backlogged blog drafts that will be completed in the near-future is a “Review of Exercise and Neuroplasticity in Parkinson’s”. Diet and brain food: Your memory is aided by ‘what’ you eat. Harvard’s Women Health Watch makes the following suggestion to boost your memory through diet (click here to read entire article): “The Mediterranean diet includes several components that might promote brain health: Fruits, vegetables, whole grains, fish, and olive oil help improve the health of blood vessels, reducing the risk for a memory-damaging stroke; Fish are high in omega-3 fatty acids, which have been linked to lower levels of beta-amyloid proteins in the blood and better vascular health; Moderate alcohol consumption raises levels of healthy high-density lipoprotein (HDL) cholesterol. Alcohol also lowers our cells’ resistance to insulin, allowing it to lower blood sugar more effectively. Insulin resistance has been linked to dementia.” WebMD summarized the role of diet and brain health in “Eat Smart for a Healthier Brain” (click here to read article). A large group of women (>13,000 participants) over the age of 70 were studied and the results showed that the women who ate the most vegetables had the greater mental agility (click here to read the article). These results suggest for a healthy brain we should eat colorful fruits and vegetables high in antioxidants; and foods rich in natural vitamin E, vitamin C, B (B6, B12) folic acid and omega-3 fatty acids. Furthermore, we should avoid refined carbohydrates and saturated fats. In small amounts, vitamin D3 is almost like candy for your brain. Mindfulness/meditation: Greater Good (The Science of a Meaningful Life) describes mindfulness as “…maintaining a moment-by-moment awareness of our thoughts, feelings, bodily sensations, and surrounding environment. Mindfulness also involves acceptance, meaning that we pay attention to our thoughts and feelings without judging them—without believing, for instance, that there’s a ‘right’ or ‘wrong’ way to think or feel in a given moment.” I recently described mindfulness as “Mindfulness means you stay within your breath, and focus within yourself, with no remembrance of the past minute and no planning for the future moment.” Here’s a simple mindfulness experience/moment: simply be aware of the steam leaving your morning cup of coffee/tea, clear your immediate thoughts, then sip, focus and savor this moment. Stress reduction: When you are under constant or chronic stress your body makes more of the steroid hormone cortisol (a glucocorticoid), which is produced by the adrenal glands above your kidneys. Over time, chronic stress can trigger changes in brain structure and function. Excess cortisol production reduces neuronal cells, over-produces myelin protective covering to our nerves, and we make more oligodendrocytes. How do you reduce chronic stress? Exercise and mindfulness/meditation are both able to lower cortisol levels. Easier said then done to making life-style changes to reduce chronic stress; however, doing it will allow the neuroplastic process to begin re-wiring your brain. For an overview of stress and trying to manage/reduce chronic stress, click here. Work, keep active mentally: There are 2 sides to this topic. First, stay engaged at work and you won’t age as fast as someone disengaged. What I’m trying to say is simply staying active mentally at work will assist your brain during the ageing process. Keep your brain stimulated with work, thought, challenges; the effort provides your brain with significant growth. 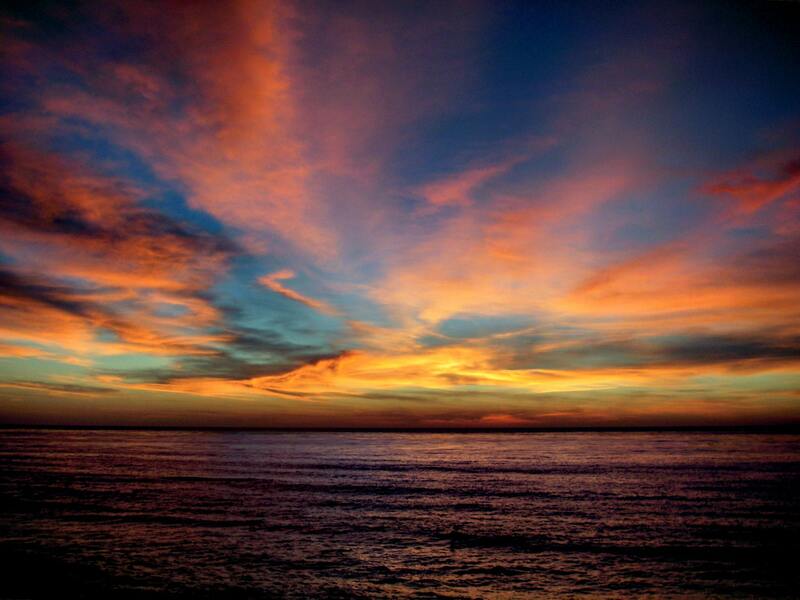 Your reward will be an active-focused and rejuvenated mind. Second, by contrast, we’re all working long hours balancing too many tasks, all-the-time; ultimately, we’re trying to multi-task when we really can’t multi-task very well. In a nice article entitled “The Magic of Doing One Thing at a Time“, Tony Schwartz summarized a key problem: “It’s not just the number of hours we’re working, but also the fact that we spend too many continuous hours juggling too many things at the same time. What we’ve lost, above all, are stopping points, finish lines and boundaries.” As you balance the 2-sides-of-the-topic, focus your energy on the first-side by performing each individual task/topic; clear your mind, keep your brain engaged, focus hard and then let your brain renew. Sleep: It’s simple; our brains, our bodies need sleep. Many of us battle with less than adequate daily sleep habits. However, it’s really simple; our brains, our bodies need sleep. Much of our day’s success resides in the quality of sleep the night before. The science of sleep is complex but much of it revolves around our brain. We use sleep to renew and de-fragment our brain; and sleep helps strengthen our memory. For more details on sleep science, please look over “What Happens in the Brain During Sleep?” (click here). Alice G. Walton very nicely summarized several aspects of the sleep-brain interactions focusing on the following 7 headings: “Sleep helps solidify memory; Toxins, including those associated with Alzheimer’s disease, are cleared during sleep; Sleep is necessary for cognition; Creativity needs sleep; Sleep loss and depression are intertwined; Physical health and longevity; and Kids need their sleep” [click here for “7 Ways Sleep Affects The Brain (And What Happens If It Doesn’t Get Enough)”]. Finally, the Rand Corp. just released a comprehensive study on sleep and the economic burden being caused by the lack of sleep (click here to read the 100-page report). A Personal Reflection on the “7 Healthy Habits for Your Brain”: My fall semester is physically, mentally, and emotionally draining; and I cherish doing all of these tasks, I really do. The writing of this blog is a deliberate attempt to remind me what I need to be doing, to re-initiate tomorrow in my daily life. I could explain each point in detail in what poor-brain-health-habits I’ve developed this semester (but I won’t). However, I am printing out the 1-page handout of 7-healthy-brain-habits to keep it with me as I spend the rest of December re-establishing effective habits for my brain; and doing a better job of balancing work with life-love-fun.